I lobbied for Nathan to be given a go at Origin level, and last Wednesday night he was given that chance. Unfortunately it all went wrong, and he was predictably made the scapegoat by an unforgiving and at times uneducated public. Nathan himself has said that he wasn’t happy with his performance, and to argue that he (or any of the Blues) had a good game would be foolish. What I am here to do is to provide a defence of his spot in the team and to attempt to take the sacrificial lamb off his head. The first few times that QLD attacked down Merritt’s wing, both he and Morris jammed in and disrupted the play before the Maroons were able to get anything happening (see this video – at 1:26, 6:15, 7:24. 12:22, 12:46. 14:33. 16:55. It was clearly a deliberate tactic. Also, just keep the video open) It’s a common defensive tactic these days where the outside men push in, rather than stay marking the man directly in front of them, to disrupt the play, while the inside sliding defenders continue to slide across behind these outside men and provide cover should the attacking team get through. This means that the opposition winger is open, but because of the bodies in motion the only safe way to get the ball to that winger is a floating pass that takes time to get there and gives the sliding inside defenders time to get across to him. It works if it is done with good communication. For example, both the winger and the centre can push in while the inside defenders push across, or just the winger can push in, but then the centre has to slide across (if for no other reason than because the winger has now covered the man he would ordinarily be defending). So the winger has to communicate well, and the centre has to be ready to push or slide at a second’s notice. The tactic is successful because it causes a lot of dropped balls when the pass goes to the inside man, as he is blindsided by the rushing wing defender. Alternatively, if the ball goes to the winger the inside defenders who are tracking across are on a good trajectory to take the winger into touch. But there are some caveats. It doesn’t work if you are TOO close to your try line (say, within 5 metres). It’s basically like switching defenders in basketball – it can backfire if both defenders aren’t ready for it – you can end up with one player with the ball in his hands, wide open. So after successfully shutting down the first couple of attempts from QLD to attack down the NSW right side defence with this tactic, Merritt went to do it the same way as they had the previous few times and Morris didn’t (17:15 in the aforementioned video). It’s the ultimate sin when you are playing with this defence. As a Centre, you either have to push in or slide out. Making NO decision and just backing off is the worst thing you can do. To the layman, Merritt is the one that looks woefully out of place because it’s his “man” that gets the ball unmarked, but Rugby League defences are more complex than that. Ultimately you would want Merritt reading the play and picking his timing better etc, but at the same time if he doesn’t rush in, the ball probably doesn’t get passed to Boyd to cross in the corner, it goes to Inglis to run over the top of everyone in front of him as he tends to do once he gets any sort of room to move. As for Boyd’s second try, it was a carbon copy in terms of defensive structure gone wrong (7:07 in this video of the second half); however Merritt did go very early which made it a lot easier for Jonathan Thurston to see him coming and get the pass to Boyd. On the other hand, the argument can be made that if Merritt went early enough for Thurston to see it and take advantage, then Morris should have had enough time to see what Merritt was doing and slide across to cover him. The first point I’ll make is that on all long kicks, all night, Queensland kicked away from Nathan Merritt. You don’t do this if someone’s weakness is kick returns. Secondly, Nathan Merritt’s average metres made per kick return in the NRL is as high as any of the other candidates for his position (16.4m). Either way, he didn’t get a chance to show this as QLD were not willing to give him the chance. Merritt’s obvious strength is with the ball in his hands, and it would have been nice to see him get it in Origin two (or either winger for that matter – I don’t think Brett Morris was passed the ball all game). Josh Morris passed Merritt the ball twice in the entire match. One of them was a hospital pass where Merritt had to immediately step inside from his wing to avoid being bundled into touch. The other pass went over his head (16:32). 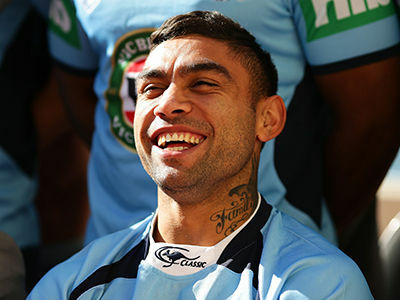 NSW picked an attacking winger, one of the most prolific try scorers in the history of the game, and he didn’t get an opportunity. Partly through some selfish play from Morris, but mostly because that’s the way the match played out. QLD were dominant and NSW had very few opportunities. But this was certainly not the wingers fault. So we are left to wonder why NSW were left in that position. And the answer is the same as it ever is in Origin matches. The forwards and the kicking. The Queensland starting forward pack ran for 621 metres. The NSW starting forward pack ran for 424 metres. The Queensland back three ran for 110 metres from kick returns. The NSW back three ran for 34 metres from kick returns. So in short, go easy on Merritt. He didn’t have a blinder but he didn’t cost us the game. And if he gets picked for game three holster your weapons and just support him. 7:18 How this isn’t a strip I’ll never know.